By Joe Gorman | January 10, 2018 at 12:05a.m. If you work Car 204 for the Youngstown Police Department, expect to be busy. In 2017, that car answered 7,450 calls, or more than 20 a day, the most of any of the 13 beat cars deployed by the patrol division. 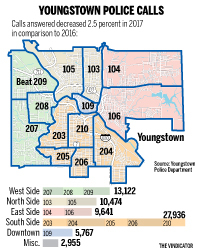 The beat, covering most of what is considered the Brownlee Woods area of the South Side, is one of five on the South Side, where 40 percent of all calls police answered in 2017 emanated. Overall, the department answered 69,895 calls last year, an average of slightly more than 191 calls a day, down 2.5 percent from 2016, when the department answered 71,663 calls. The second-busiest beat in the city was also on the South Side, Car 206, which answered 6,944 calls in 2017. The third-busiest beat was on the West Side with Car 209, which answered 5,208 calls. The South and West Sides represent 59 percent of all calls answered in 2017. Police Chief Robin Lees said those sides of town have large call volumes because they’re the most heavily populated areas in the city. In addition, Car 204’s beat covers one of the largest geographic areas, accounting for its high call volume, Lees said. Car 206’s area is more compact, but it answers more serious calls, Lees said. A three-year study on the number and seriousness of calls conducted by mathematics students at Youngstown State University helped the department determine where patrol cars should be based. The results of the study led to additional cars on the South and West sides and one fewer car on the East Side. Lees said the majority of patrol cars are one-officer cars, but several days a week on midnight and afternoon turn, a two-officer car patrols. Lees said he likes two-officer cars because it allows the officers to be more proactive while on a traffic stop or patrol because they do not have to wait for backup. Lees said sometimes, however, a two-officer car cannot patrol because of insufficient personnel. He said he leaves the decision to have two-officer cars to the discretion of his shift commanders. Lt. Brian Walsh, who heads the afternoon-patrol shift, said he assigns two-officer cars based on activity on a given beat, such as gunfire, where a crew of two would boost officer safety. Walsh said typically only one two-officer car can patrol on his shift because of staffing constraints. “The No. 1 issue is staffing,” he said. Lees acknowledged patrol officers can sometimes be stuck just going from call to call, which does not leave much time to interact with residents. He said the Community Police Unit that he implemented when becoming chief helps to fight that problem. 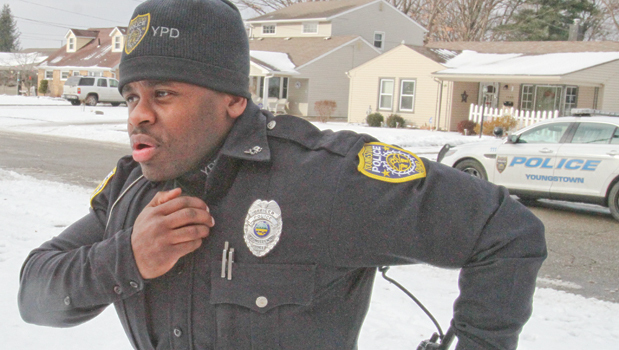 In it, one officer is assigned to each of the city’s seven wards and each has time to address community concerns and talk to residents without having to answer calls. November 6, 2015 12:07 a.m.
March 8, 2015 12:10 a.m.
June 12, 2013 12:01 a.m.
February 11, 2018 12:10 a.m.